Pit bulls have a long history as nanny dogs, service dogs and all around great pets. What many people may not know is that pit bulls also have a long history of fighting for our country. Thank you to all who serve, human and canine! Sallie was a lady; she was a soldier too. She marched beside the colors, our own red white and blue. It was in the days of our civil war that she lived her life so true. 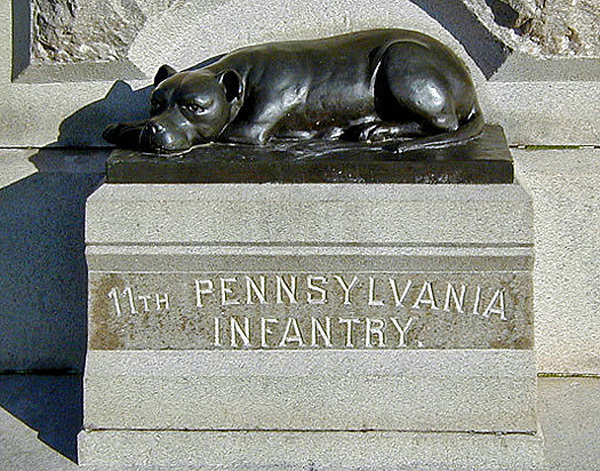 Sallie was a brindle Staffordshire bull terrier (or pit bull terrier – it is unclear) who served as the regimental mascot for the 11th Pennsylvania Volunteer Infantry during the Civil War. She was given to 1st Lt William R. Terry as when she was just 4 weeks of age. Sallie was raised with the men of the regiment and they were fond of her. She knew the specific drum roll announcing reveille. Sallie followed the men closely on marches and to the battlefield, always on the front lines. In a spring 1863 at a review of the Union army, Sallie marched along with “her” soldiers. Abraham Lincoln sat in the center of the reviewing stand and spotted the dog. He raised his famous hat in salute. At Gettysburg, Sallie became separated from the 11th in all of the chaos. Three days later they found Sallie guarding the bodies of the dead and wounded soldiers, herself unscathed. In 1865 at Hatcher’s Run Sallie was struck by a bullet to the head. She was killed instantly. She was buried on the battlefield while under heavy enemy fire. In 1890 in appreciation of her loyal devotion, a monument of Sallie now stands in Gettysburg, directly in front of the monument that commemorates the 11th Pennsylvania Infantry. 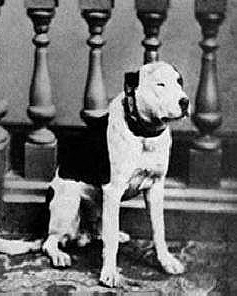 Jack, who understood bugle calls, was the mascot for the 102nd Pennsylvania Infantry. This fine soldier was a dependable member in his unit. His career spanned through nearly all the regiment’s battles in Virginia and Maryland. 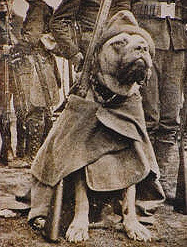 Jack was, however, captured twice and became the only dog to be traded as a prisoner of war; during his second capture he was exchanged, according to wartime protocol, for a Confederate soldier at Belle Isle. Jack disappeared shortly after being presented a silver collar purchased by his human comrades and was believed to be a victim of theft. 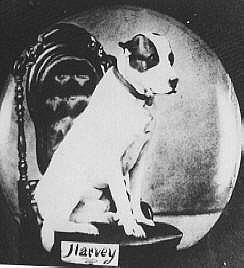 The 104th had a portrait of Harvey commissioned so that he could still be part of their reunions after his death. Today, Harvey is remembered by the Western Reserve Historical Society in Cleveland, where a portrait of the troop features a proud Harvey posing with his fellow soldiers. Jack Brutus was another fine soldier (shown here in uniform). Serving during the Spanish-American war, he became the official mascot for Company K, First Connecticut Volunteer Infantry. “Old Jack,” as he was known, and his unit spent most of the war encamped at various places in the states providing coastal defense from Maine to Virginia. Old Jack died of spinal troubles in 1898. The pit bull’s steady temperament, extreme level of intelligence, acceptance of training and steadfast sense of loyalty made them the perfect military mascot. 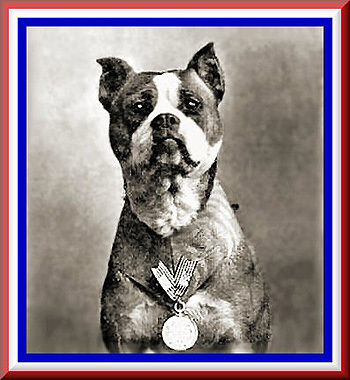 The first decorated canine war hero and the only dog to be promoted to sergeant was pit bull-type dog named Stubby. Born in 1917, he wandered into a Connecticut National Guard encampment on the Yale University campus. He was a scrawny little pup of about 4-weeks-old, found there by John Robert Conroy who smuggled his beloved companion aboard the troop ship, the SS Minnesota. Stubby learned to salute and his military career began. He served beside Conroy in the 102nd Infantry 26th Yankee division during WWI in the trenches of France. There Stubby would seek out wounded soldiers, which were significantly less because Stubby could hear the whine of incoming artillery shells before the humans and became quite adept at letting his unit know when to duck for cover. After being gassed, Stubby began warning his unit of poison gas attacks. There is no way to know how many American soldiers Stubby saved, but the respect he was given by the U.S. after the war is a clear indicator of how valuable this dog was to the men of his unit. During his military career, Stubby aided in the capture of a German spy and was severely injured by shrapnel and sent to the Red Cross hospital for surgery; he was then awarded the Purple Heart and sent back to his regiment. After the battle for the French village of Domremy, the grateful women of the township fashioned a hand-sewn chamois coat to display Stubby’s service chevrons, metals, pins and buttons; this became his recognized trademark and is now on display at the Smithsonian Museum. In his lifetime Stubby was invited to the White House by three presidents—Woodrow Wilson, Warren Harding and Calvin Coolidge. In 1921 John Conroy and Stubby headed to Georgetown to enroll in law school where Stubby became a practicing Hoya and served several terms as mascot to the football team. Between halves, Stubby would nudge a football around the field with his nose to the delight of the crowd. Some deem his performance the inspiration for the trend toward elaborate halftime shows at football games across the country. 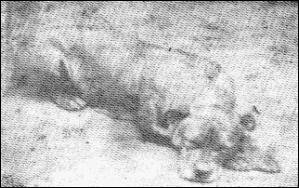 Stubby died of old age in 1926 in the arms of his friend John Conroy. His long life as a hero and companion exemplifies the pit bull characteristics people know and love. Article originally posted in May 2011. Ignorance and fear are a pit bull’s worst enemy. Thanks for the article. Very interesting! This is a great salute. Thanks. love this . thank you! Thank you for sharing this article from a proud pit bull owner! @LeeMadison I am going to steal that too lol…Love our pitties. Awww I <3 Sgt. Stubby!!! He is the “poster child” for all pit bull type dogs! the people who are willing to persecute this breed are just threatend by the idea of a dog being not only physically superior but obviously mentally superior as well who’s really evolved? I knew about Sallie (ggogle her and check out her memorial — people still leave dog biscuits there) and Sergeant Stubby — thanks for filling me on on those other Civil War heroes! Pit bulls are the best! I’ve been to the Gettysburg battlefield and seen the monument to Wallie. It’s moving. I’ve been to the Gettysburg battlefield and seen the monument to Sallie. The experience was deeply moving for me as a dog person, though at the time, I didn’t know much about pit bulls. Looking back on it now, after 2 wonderful years with my pit bull, Herman, the experience has new meaning for me. @dragondix2 How wonderful, thanks for sharing that. Enjoyed reading of your visit to Sallie’s statue and about your dog, Herman. We had a pit bull mix for many years, and she was the soul of devotion. My husband rescued her from an animal shelter where she would have been put down (not because she was a pit bull but because she seemed to be unadoptable for other reasons) and although she loved us both, it almost seemed as if she understood that he had saved her. @LoyaltyOfDogs It’s amazing how dogs seem to realize when we save them…and truly it’s them who save us. @LoyaltyOfDogs I’m sure she did know. I can’t explain it, but I’m convinced they do. What a cool story. Thanks for saving this precious little girls life. This is an incredible article. I’m glad I didn’t miss it the second time around.